You Think Your Customers are Happy? Do This & Watch How Fast That Changes! Manufacturers hold dealerships accountable for customer satisfaction and the overall experience in both sales and service through surveys. Dealerships that fall behind the acceptable OEM standards can easily suffer consequences that reduce revenue and marketing exposure. And OEMs are increasingly tightening down on these expectations. Why? Because they value brand loyalty and retention. If a customer consistently has a poor experience with their vehicle, local dealership, or both, it is that much easier for a competing brand to conquest that customer, causing loss of market share. It is an industry-wide problem as we all know that many customers fail to complete those OEM surveys. And, just like online reviews, the customers that do complete them are typically on opposite ends of the spectrum – they either love the dealership or they hate it. Most consumers in the middle simply delete the email or throw away the physical survey, never bothering to fill it out. On top of that, taking your vehicle in for service does not rate at the top of many people’s list as the most fun thing to do. They simply don’t have the time to do it so it’s already an inconvenience for them, but they still do it because they want their vehicle operating safely and efficiently. Well, here is where the importance of a great customer experience on every single visit comes into play. But, there is one area that trips up many dealerships and contributes to those poor CSI surveys. Imagine this scenario: The customer brings their vehicle in for regular maintenance or to get a problem fixed. The problem gets fixed perfectly and the customer experience is spectacular. The customer is very happy — until they get home, open their mail and find a recall notice on the same vehicle they just brought into the dealership. Why did the dealership not inform them and fix it during their visit? That scenario plays out every day in dealerships across America. Now, they realize they must again find time in their busy schedule to RETURN To the dealership to get the recall repair completed. Not only does a return visit draw the customer’s frustration, but it also causes them to question whether the dealership can be trusted with assuring vehicle safety. It’s one of the primary reasons why consumers go to dealerships for repairs rather than independent repair shops. Once you’ve lost a customer’s trust, it’s not hard for them to defect from your dealership. These customers are also likely to give a bad survey result, spread the word on social media, advise others to avoid your dealership, go on Yelp to hammer your ratings, and perhaps will never again return. Customers rely on your dealership’s knowledge and expertise to ensure their vehicle is maintained properly. Missing something as important as a safety recall during the check-in process or MPI, simply due to a failure to check, lack of resources, or some other reason, is a failure on the dealership’s part. In the customer’s eyes you are not keeping your promise of keeping their vehicle correctly serviced and safe for them to drive on the road. Even if you don’t have available parts or shop capacity at the time of their visit to fix the safety recall, simply informing them that the circumstances exist, explaining why it cannot be fixed during their visit and that the dealership will schedule the repair as soon as the parts are available, will go far to diffuse their frustration and make for a happier customer. Sure, they’ll be inconvenienced. However, as long as the dealership staff handles the situation with good communication, are transparent, knowledgeable and can advise the customer, chances are great that the customer will forgive and understand. And that will go a long way towards retention, customer experience and satisfaction. 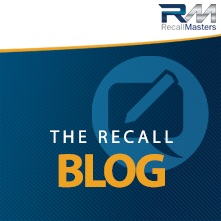 Subscribe to the "Recall Roundup" newsletter, a summary of news, findings, insight, updates and product developments revolving around automotive recalls. Your email will not be shared with organizations outside of Recall Masters. Subscribe to the "Recall Rundown" newsletter, a summary of news, findings, insight, updates and product developments revolving around automotive recalls. Your email will not be shared with organizations outside of Recall Masters.